Home » Columns » It’s Better to Give! “To be there, working side-by-side with such great people, there’s nothing that compares with that,” my dad exclaimed. My father Russell Koch is a very innovative man. Thirty-three years ago he started a silo repair business. One of the reasons he is a successful entrepreneur is that he finds solutions to his clients’ problems, even if the requests are out of the ordinary. A couple of years ago my dad had the opportunity to be innovative and use some of the spare silo materials he had stored. 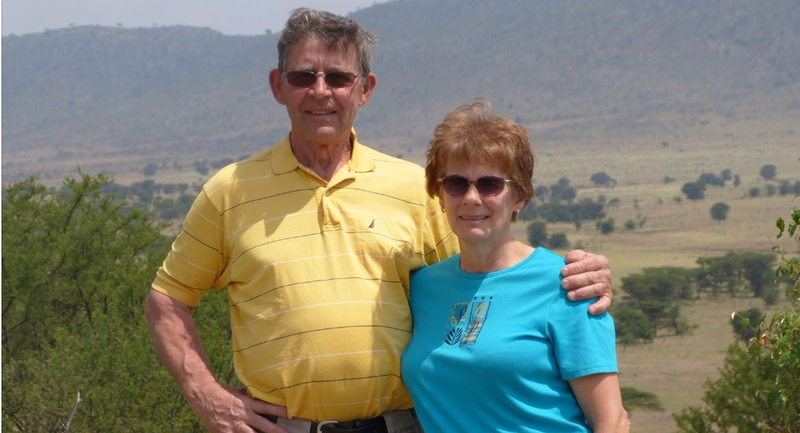 For many years his cousin Lloyd and his wife Earla have been involved in improving the Shirati KMT Hospital facilities in Tanzania. In 2010 they started to search for solutions to the hospital’s water storage problem. The hospital pumped water in from nearby Lake Victoria, but their water tank was in poor shape and constantly leaked. In 2015, Lloyd approached my dad to help them repair the existing tank. My dad thought it would be better to build a new tank. He had the parts of a Harvestore silo that, in his mind, could be a great solution to their water problem. He discussed the idea with Lloyd, and a new project was born. My dad donated the silo and booked a trip to Shirati. My mom Hazel got involved as well. A container was rented to ship the silo parts to Tanzania and since there was extra space they, along with friends, family and church members donated items for the hospital and surrounding communities. While my dad built the water tank, my mom gave sewing lessons to women from the area and helped distribute the donated layettes, clothing, toiletries, and school supplies. When my parents came home, their excitement and joy were clear to see. They told us how happy the hospital staff were to have enough water for their daily needs. My dad loved working with the people of Shirati who helped build the tank. “To be there, working side-by-side with such great people, there’s nothing that compares with that,” my dad exclaimed. Their experience made me think of Acts 20:35, “And I have been a constant example of how you can help those in need by working hard. You should remember the words of the Lord Jesus: ‘It is more blessed to give than to receive” (NLT). Columnist Sharon Salzberg writes, “Generosity generates its power from the gesture of letting go. Being able to give to others shows us our ability to let go of attachments that otherwise can limit our beliefs and our experiences . . . [and we can] carry ourselves to a state of greater freedom. In short, being able to step outside of oneself and give is an essential ingredient for happiness” (The Real Power of Generosity, http://www.onbeing.org/blog/the-real-power-of-generosity). Lloyd had mentioned the needs of Shirati to my parents two years previously, but my dad wasn’t interested. Once he went, however, the experience changed him. It impacted him so much he went back the next year for six weeks to help them build a new intensive care unit. My parents have a newfound passion for the people in Shirati. They stay in touch and are dedicated to supporting the community financially. The fear of not having enough might be holding us back from being generous. Instead of giving, we can be prone to hold onto things to try to find happiness, but the Bible reveals that real joy is found in being generous. It may not make sense that giving up something that is precious to us (our money, our possessions, our time) can bring us joy. Yet experiences like that of my parents prove that it is true; that generosity is not only beneficial to the recipient but also provides joy to the giver. Perhaps you’ve heard this message many times but haven’t tried it for yourself. Give generosity a try, and, without any obligation, let Abundance Canada help! Wendy Helgerman is the Communications Specialist at Abundance Canada. For more information on impulsive generosity, stewardship education, and estate and charitable gift planning, call 1.800.772.3257 or visit abundance.ca.